Join in on the patriotic fashion in this fashionable hand painted American flag shirt. The shirt’s distressed look and classic fit makes it perfect for quick day to night outfits. During the day wear the shirt with a dark wash pair of jeans and some flip flops for a casual outing. Change it to a night out look by throwing on a blazer with some nice shoes. 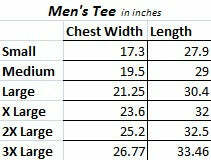 The shirt is 100% cotton and has been preshrunk so no need to over think it, just buy your normal shirt size. Available in sizes S-2XL.